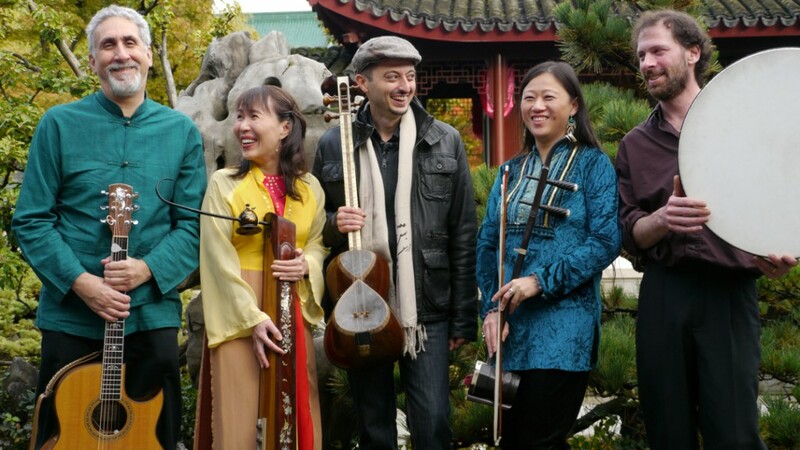 An ensemble that sounds like how Vancouver looks, Sounds Global Ensemble’s diverse repertoire is drawn from Jewish, Persian, Taiwanese, Vietnamese, Indian and Chinese music. This band is comprised of some of Vancouver’s most active musicians in the world music scene: Moshe Denburg on guitar, Ali Razmi on tar, Jonathan Bernard on percussion, Lan Tung on erhu (Chinese 2-string violin), Amy Stephan on accordion and Irish whistles, and Bic Hoang on danbau (Vietnamese 1-string zither). They are also singers, creating an unusual mix of ethnic vocal styles. The Sounds Global Ensemble is formed to represent the Vancouver Inter-Cultural Orchestra (VICO) at festivals and events when it’s not feasible to have the full orchestra on stage. The musicians of the Sounds Global are also members of the orchestra. They represent the different cultural backgrounds where VICO musicians have come from. Bic is a multi-instrumentalist, exceptional vocalist and arranger. She specializes on the danbau (one string zither) and a number of very rare instruments from Vietnam’s rural and mountainous regions including the t’rung (bamboo xylophone), k’longput (percussion tubes), and koni. Bic began studying music at age 8, and for the next 14 years, she was trained under a number of Vietnam’s top masters. In 1987, Bic graduated with honors from the Hanoi National Conservatory of Music and was invited to join the faculty at the Hanoi Music and Arts College. Bic moved to Canada in 1992, and she has continued her career as a performer, arranger and instructor. She has been expanding her musical repertoire by collaborating with a number of World Music and New Music artists, and performing with chamber orchestras and symphony orchestras. Bic has toured 24 countries both as a solo artist and with the Khac Chi Bamboo Music. Crossing between Vancouver’s new music, improvised music and world music scenes, erhu/Chinese violin performer and composer Lan Tung is the artistic director of the JUNO nominated Orchid Ensemble. She also performs with the world/Indian fusion band Tandava, contemporary jazz/improv trio Birds of Paradox, and Mozaico Flamenco Dance Theatre and serves as the vice president of the Vancouver Inter-Cultural Orchestra. Originally from Taiwan and trained extensively in Chinese music, Lan enjoys taking culturally specific music outside its context, fusing together various styles. She has studied graphic score with Barry Guy, improvisation with Mary Oliver, and Hindustani music with Kala Ramnath. At the Vancouver Creative Music Institute (2007-2009), she has studied and performed with Han Bennink (Holland), Barry Guy, Evan Parker, John Butcher (UK), Francois Houle, Paul Plimley…etc. Lan has premiered numerous contemporary chamber and orchestral works, including Mark Armanini’s erhu concerto with theSymphony Nova Scotia at the 2010 Canadian New Music Network conference. Lan tours regularly and has performed at the Kennedy Centre, the Chan Centre, the Smithsonian Institute, the National Arts Centre, Ottawa Chamber Music, Folk and Jazz festivals, and given lectures and concerts at universities across North America. Ali Razmi is an innovative Tar and Setar player who has performed in wide variety of genres, from traditional Persian music, popular music, to fusion and various world traditions. Ali received his M.A. from The Art University of Tehran in 2006. He has performed both as a soloist and in chamber and large ensembles in Iran, Turkey, Azerbaijan, India, US and Canada. The highlights of past performances: as a soloist with the Iranian Philharmonic Orchestra, improvisation with Master Shajarian (Iran’s leading singer in traditional Iranian music), and performances with Mehran Modiri and Mohamad Esfahani. In 2002, Ali performed at the Jahane Khusrau Music Festival in New Delhi as a member of the Rumi Group. Ali is a member of the Vancouver ensemble Navaz, which fuses Persian music with a variety of Western genres, such as jazz, Latin and blues. Moshe Denburg (b. 1949) grew up in Montreal, Canada, in a religious Jewish family. His musical career has spanned 4 decades and his accomplishments encompass a wide range of musical activities, including Composition, Performance, Jewish Music Education, and Piano Tuning. He has travelled worldwide, living and studying music in Canada, the USA, Israel, India, and Japan. Since 1987 his compositions have reflected an ongoing commitment to the principle of inter-cultural music making – works that bring together the instruments and ideas of many cultures. To this end, in 2001 Mr. Denburg established the Vancouver Inter-Cultural Orchestra (VICO), a vehicle for the realization of his, and other Canadian composers’ inter-cultural work. He is also an associate composer of the Canadian Music Centre. Jonathan combines his background in Western percussion with a fascination for Asian traditions to create a unique sound palette incorporating a myriad of instruments, techniques and styles. Jonathan’s interests span genres from orchestral music to New Music, and World Music. Having premiered over seventy chamber works, Jonathan performs with Orchid Ensemble, Tandava, Vancouver New Music, Fringe Percussion, and numerous orchestras including Vancouver, Victoria, Ottawa, National Ballet, CBC Radio Orchestras, as well as Vancouver Inter-Cultural Orchestra. He is currently the principal percussionist with the Vancouver Island Symphony. Jonathan’s interest in world music has led him to perform Chinese, Javanese, Balinese and Korean music and study traditional and contemporary Chinese percussion in Beijing, China, Arabic percussion in Cairo, Egypt, Carnatic rhythms in South India, and cajon/Flamenco music in Spain with the support of the Canada Council for the Arts and the British Columbia Arts Council. Jonathan has toured throughout North America, Europe, and Japan.